I received quite a surprise in my email this morning. 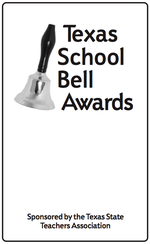 I had no idea that Edie Clark, President of the Spring Branch Education Association nominated this blog for the Texas State Teachers Association (TSTA) School Bell Award for Outstanding Education Blog. So it came as a complete surprise this morning to learn that this blog has been selected by TSTA for this Award. 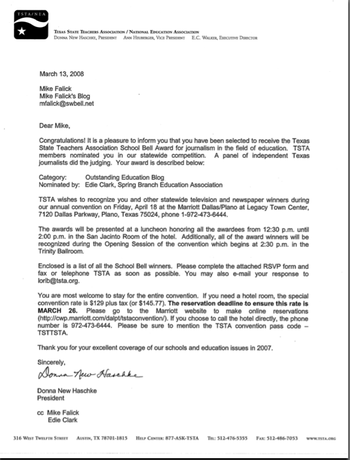 Here is the letter I received from TSTA and information about the Texas School Bell Awards. Congratulations and Amen on this being a premier blog. As I'm just entering the blogging world I have come to rely on this blog for up to date information and sound opinions.